Anna (Zoe Lister-Jones) and Ben (Adam Pally) can’t stop fighting. Advised by a therapist to work through their problems unconventionally, they are reminded of their shared love of music. So, in a last-ditch effort to save their marriage, Anna and Ben decide to turn their fights into songs and, with the help of their neighbour Dave (Fred Armisen), they start a band. While Band Aid’s premise is interesting, it also sets alarm bells ringing. A comedy where a warring couple turn their arguments into songs? It is just too easy to imagine how this concept could go horribly (uncomfortably) wrong. 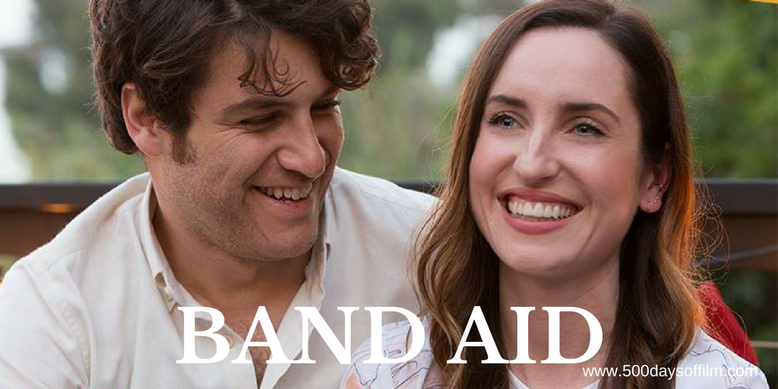 Thankfully, however, under the watchful and insightful eye of writer, director Zoe Lister-Jones, Band Aid is a consistently funny, heartbreakingly poignant exploration of grief. We don’t understand this at first, of course. All we see is a couple who fight over the slightest grievance. We like them both, but they seem destined to split - particularly following a nasty confrontation about a pile of dirty dishes. It’s make or break time. Or in Anna and Ben’s case it’s make music or break up. For, as it turns out, both are pretty good at expressing themselves through music and, together, they have a lot of fun doing so. In a lesser film, that would be the end of the story. Anna and Ben would make music, enlist an eccentric drummer (a quirky, comedic role played by Fred Armisen), form a band and live happily ever after. Band Aid isn’t content to paddle in these shallow rom com waters. Lister-Jones has far deeper, more complex themes to develop. Themes of grief, repression and the lasting impact of loss. In an emotionally powerful scene, the pain of the past is revealed... and it is devastating. Comedy becomes heartbreak as Lister-Jones reveals a couple who are unwilling to look back and unable to move forward - both hiding behind their loss, both using their disappointments in life as an excuse not to live. In these moments, the movie is honest, powerful and incredibly insightful. Humour is never far away, however, relieving the tension and lifting the mood. Band Aid is a charming, entertaining and surprisingly moving film. Have you seen Band Aid? If you have, what did you think of this movie? Let me know in the comments section below or via Facebook or Twitter (@500DaysOfFilm).